While Olathe North kept it's title as the lone undefeated team in the Sunflower League, the Indians from SM North lost their third straight game. The contest might as well have been called the James Franklin show. 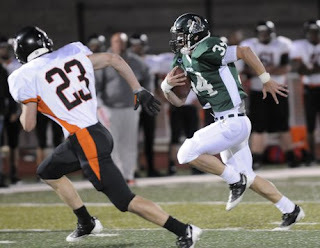 He ran the ball 23 times for 200 yards and three touchdowns in just three quarters of work. Olathe North will now begin preparing for their upcoming showdown with the red-hot Free State Firebirds--a game that has stood out on the Sunflower League calendar for weeks. Despite playing their best game yet, the Lawrence Lions were unable to notch a victory against Olathe South's spread attack. Lawrence jumped out to a 15-0 lead on touchdown runs from Tyrae Jenkins and Christopher Gaston, but the lead would not hold. Olathe South scored 26 unanswered points before the Lawrence chipped in a fourth quarter score. Olathe East's Brooks Smith punched in an 11 yard touchdown run in the first quarter for the Hawks, and that would turn out to be all she wrote. The Sunflower League's lowest scoring affair thus far was the epitome of smashmouth football. Olathe East's Brandon Willingham rushed for 168 yards on 19 carries, while Olathe Northwest's Brandon Bouvilom led the Ravens with 63 yards rushing on 15 carries. Ultimately, Olathe East's opening drive score was the game winner. Everyone knows that Lawrence Free State has been playing well lately, but their clobbering of SM Northwest really put an exclamation point on the idea. The Firebirds rushed for 445 yards in the game, 201 coming from running back Kirk Resseguie (below), and 152 coming from Camren Torneden. SM Northwest quarterback Matt Nowak's 76 yards passing and 15 yards rushing weren't nearly enough to keep the Cougars competitive in the game. After a less-than-impressive first half, SM West outscored SM South 21-0 in the third quarter to grasp control of the game. Leading the Vikings were DJ Balazs who completed 12 of 20 passes for 151 yards and one touchdown, and running back Cordi Pascal who ran the ball 16 times for 104 yards and two touchdowns. Leavenworth, like Lawrence, displayed their best for parts of their game Friday. The Pioneers were able to hold SM East scoreless in the first quarter before the Lancers took off en route to 34 points. Leavenworth's lone score came in the fourth quarter on a three yard run by Cody Frazee. 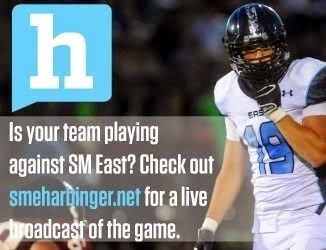 SM East on the other hand has won its last two games after beginning the season 0-3.